check out all the great projects linked this week. been pulling out garden ornaments in need of some attention. 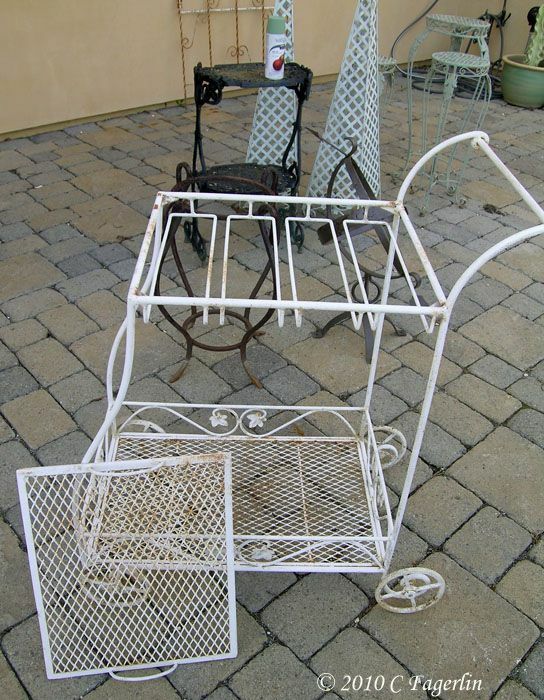 I'm tired of the "rust"
began this project back at the turn of the year by redoing an old birdcage. pink girly girly guest room, then moved to the garden for a number of years. It certainly needed some sprucing up for Spring! waiting in line for their makeover. added some potting soil and here is the little wash stand all ready for a summer in the garden. keep on moving and come back to see what goes green next! Candy, You are a woman after my own heart! 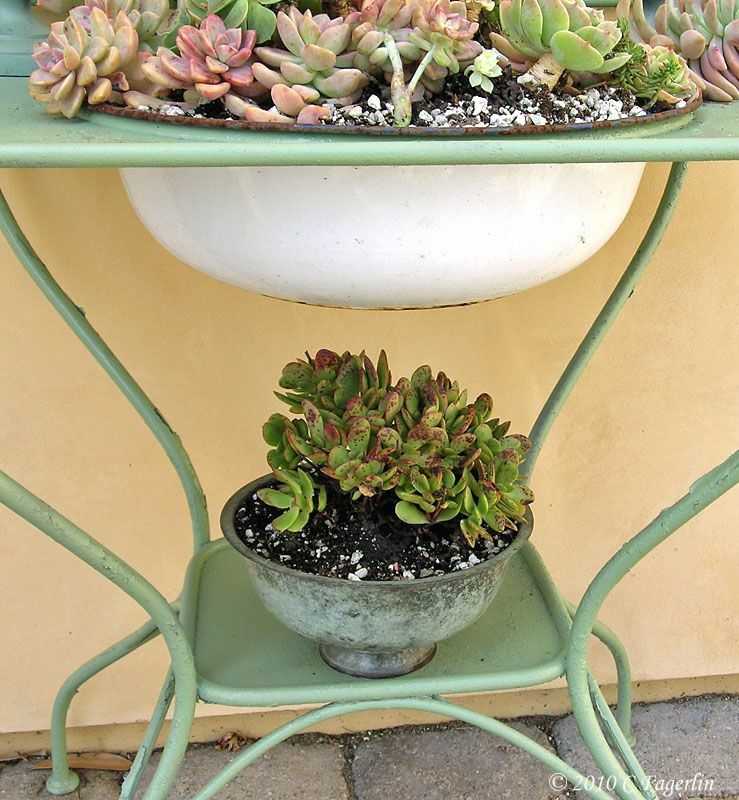 I've spray painted so many garden "thingies" green. 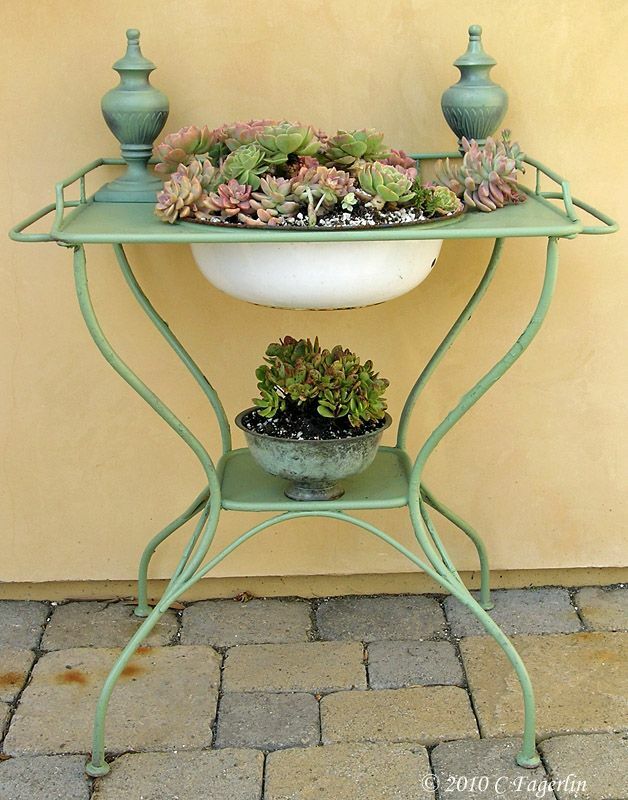 I love your wash stand with the succulents and I can't wait to see how you "plant" the tea cart and bird cage. Thanks for the inspirations. 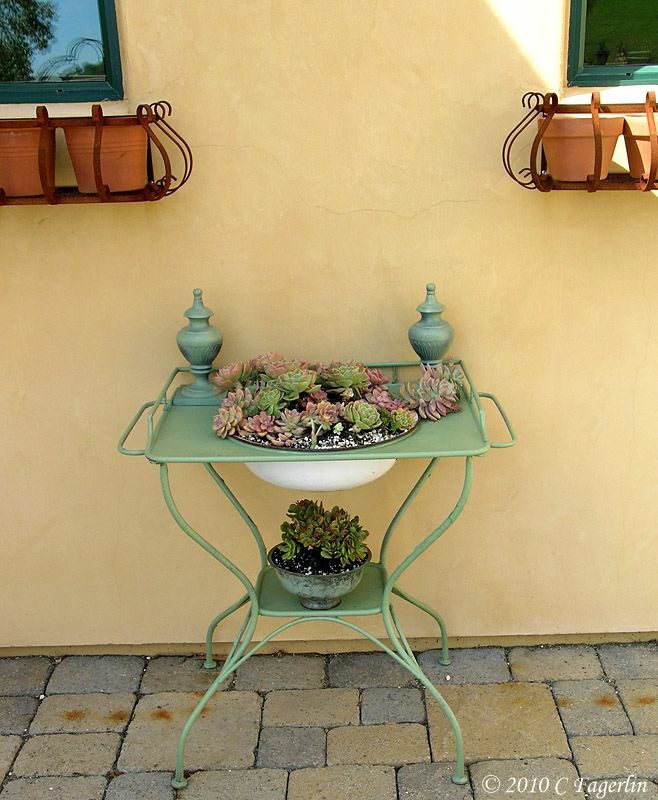 Those succulents have the perfect new home. It looks great! Looks like you've been busy! 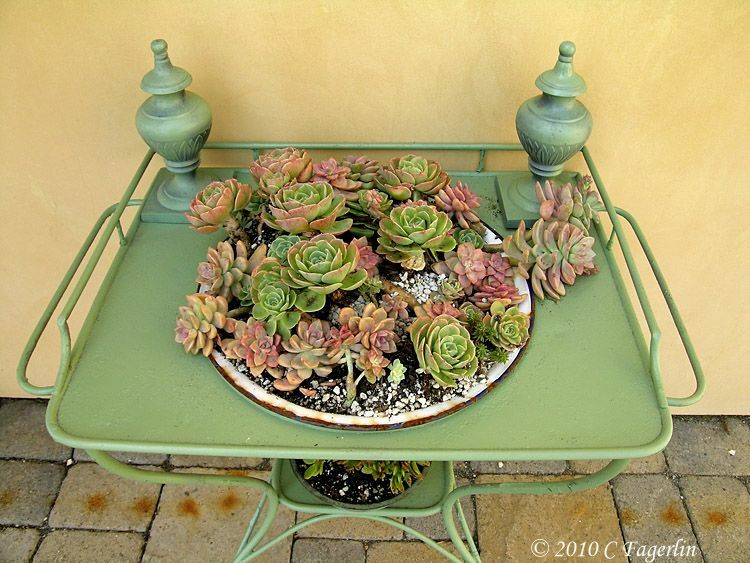 The succulents look amazing. I love the succulents that you planted in your watch me call it.........LOL........and I love the watch a me call it too! All the happenings at Happenstance are so inspiring...the first roses, new decorative pieces, succulants in pretty pots and on bird houses...keeps me going until our Spring arrives in a month or so! Love what a can of spray paint can do!! 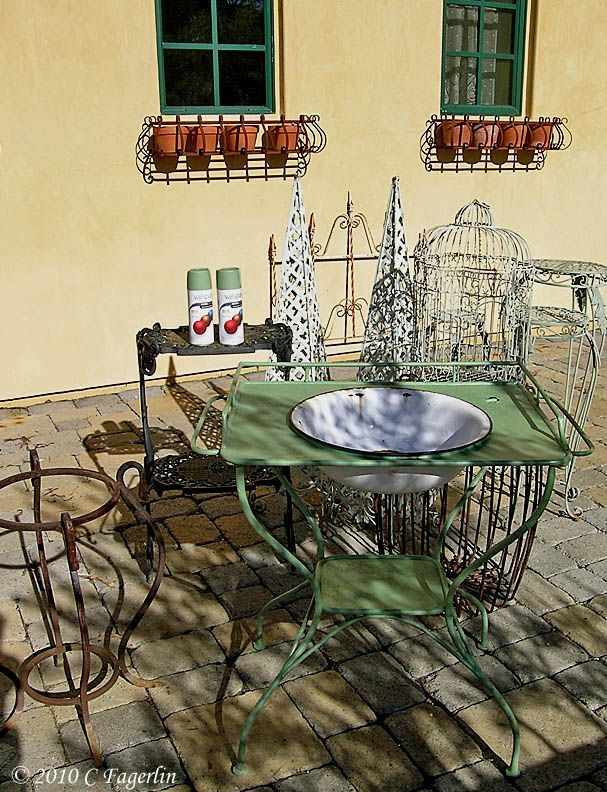 I have some wrought iron pieces to paint, so I'd like to know if you sanded and/or primed first? What kind of paint did you use? I do love the instant gratification of spray paint! SandyS - none of that sanding and priming for these items. All of these things live in the garden, so I don't see the need for all that extra effort. They will soon be covered with pots and vines and such .... I'm going for the rustic look. LOL Inside use would be a different matter, so as not to mar floors/carpets etc. 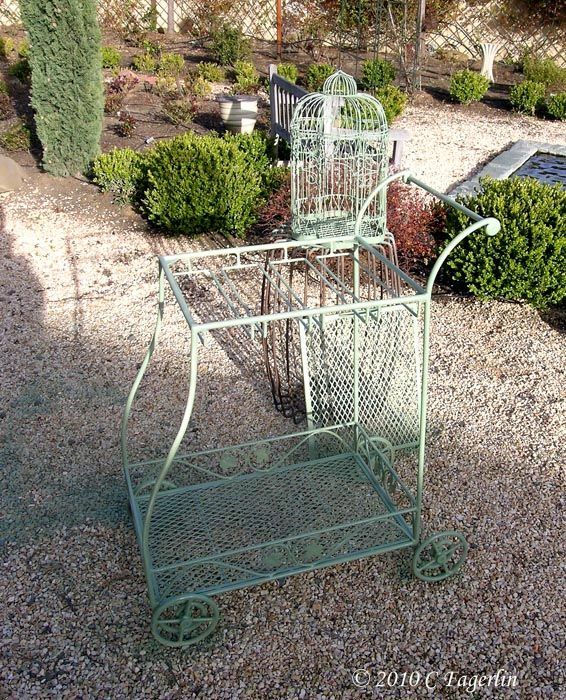 The tea cart is now green and was shown in a post today, but is destined for another use by Friday. Wow! I'm jealous...I love all the metal finds! They turned out fabulously!! Spray paint is one of my favorite things. Thanks for stopping by Sharon!